John Malkovich has proven that imitation really is the sincerest form of flattery. The actor has linked up with world-renowned portrait photographer and old pal Sandro Miller on a new art project to recreate iconic photographs that inspired Miller’s 30-year career. The exhibit, entitled “Malkovich, Malkovich, Malkovich,” features 35 images in which Malkovich gives us his best impersonations, from Annie Leibovitz’s snapshot of John Lennon and Yoko Ono to Andy Warhol‘s “Green Marilyn.” His depiction of Pablo Picasso is spot-on, and so is his haunting portrayal of Dorothea Lange‘s “Migrant Mother.” It’s worth a double-take, or three. 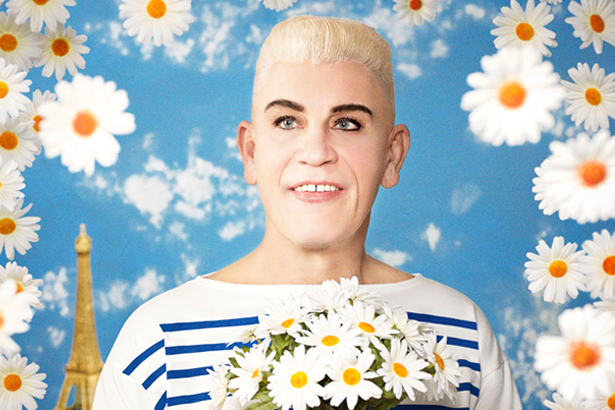 Then there’s his hilarious transformation as the boyish Jean Paul Gaultier in the painted image by Pierre et Gilles, created in 1990 for the designer’s autobiographical photo novel, À Nous Deux la mode. Brilliant. How has this man not won an Oscar? “Malkovich, Malkovich, Malkovich” will run from November 7, 2014 to January 31, 2015 at the Catherine Edelman Gallery in Chicago.